Especially for the little tinkerers there is a whole area in the “Kohlebunker” only with workshops. MINT Campus Dachau e.V. The MINT Campus Dachau (MCD) is a student research centre in the middle of Dachau. VARIOBOT – Roboterbausätze zum Experimentieren The biologically inspired robots varikabi and varikabo can be built directly on our stand. Finally, you can bring your little robot animal to life, test it on different courses and take it home. Fab Lab Erfindergarden München Erfindergarden is a Fab lab/youth center for children and teenagers in Munich. FabLab Oberland – Workshop etc. für Kinder At our stand you can create your own individual souvenir of the fair: embroider your (brought along) T-shirt yourself with a “make munich” logo or a self-designed motif. Roboter-Workshop – Bau deinen Hebocon Roboter! You want to join the Hebocon on Make-sunday? But you don’t have a robot? No problem! Visit our workshops on saturday or sunday morning and create your own. 3D-Steckpuzzle für Kinderhände wooden toys cut from 3mm plywood with a lasercutter. Munich 7th Dec, 2018. Make Munich is Southern Germany’s largest maker and do it yourself festival, which will take place for the fifth time in Munich next March. It has been firmly established in Munich since 2013 and will even be expanded by a second exhibition hall in 2019. On 2nd/3rd March 2019, the makers will present their creative ideas, inventions, projects, technologies and their open, colourful culture of innovation. 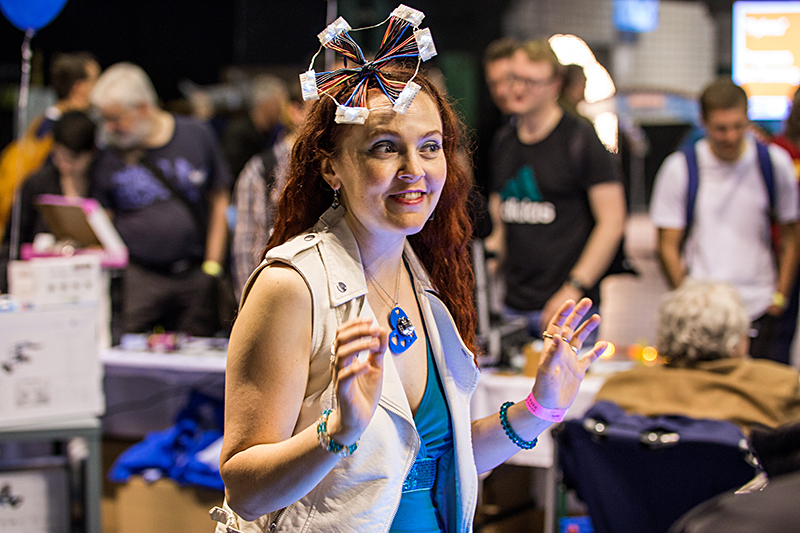 At the exhibition booths and in many inspiring lectures, the Maker scene will be experienced in its entire variety. But it’s not just about spectating, it’s also about doing it yourself and experimenting: In numerous hands-on workshops “new makers” are taught all the skills they need to be creative and inventive and to produce their own things using modern technologies. The Munich Maker Festival is a colourful public event for all ages. You can touch and try out high-tech here. The mega topic of digitisation can be experienced by everyone in a comprehensible and creative way. The diverse topics at Make Munich include electronics, Internet of Things (IoT), 3D printing, digital tools, robotics and fashion technology. Maker start-ups show the way to professionalisation. FabLabs and Makerspaces present their ideas and creative communities. Also projects and initiatives from the circular economy, repair culture, bio-hacking and design & craft present themselves to the public. A completely new feature is a separate large area for the “Young Maker” young talents. In addition to 180 exhibitors, more than 10,000 visitors from Germany and the neighbouring countries Italy, Switzerland and Austria are expected. Our long-standing partner and main sponsor, Allnet GmbH, will be networking the maker scene with established medium-sized companies from its surroundings in a dedicated area in the new “Kohlenbunker” hall on the Saturday of the fair. As the new main sponsor, Siemens AG is also on board to promote the maker culture and innovations across society. As a close educational cooperation partner, Munich University of Applied Sciences will present many exciting university maker projects. Other colleges and universities will also present their FabLab initiatives and ideas. Is the annual Munich Maker and Do-it-Yourself Festival. The aim of the event is to give the maker scene of developers, inventors, designers and artists a platform for presentation and networking, and to give visitors outside these circles access to new technologies, workshops and possibilities for democratizing the means of production. As a festival “by makers for makers”, the organization of Make Munich is largely supported by the Munich maker community. Since 2015, the newly founded Make Germany GmbH has provided Make Munich with a firm business and organisational framework. The Make Germany GmbH is a Social Enterprise, which is dedicated to the promotion and networking of the maker scene. 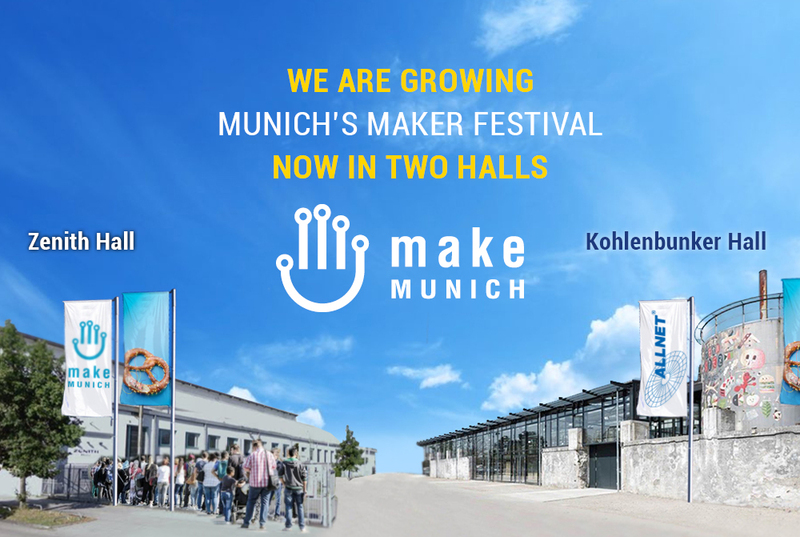 Open: from 10 a.m. to 6 p.m.
Make Munich 2019 will be bigger than ever: Together with our partner and maker supporter ALLNET GmbH, we will add in the neighbouring “Kohlenbunker” hall in addition to the Zenith hall this year. On Saturday, the motto will be: Maker meets Pro! when ALLNET’s ICT Area will be opened to Make Munich visitors. You’re tinkering in your garage? You sew in the studio? You solder in makerspace? You reinvent the world in Fablab? 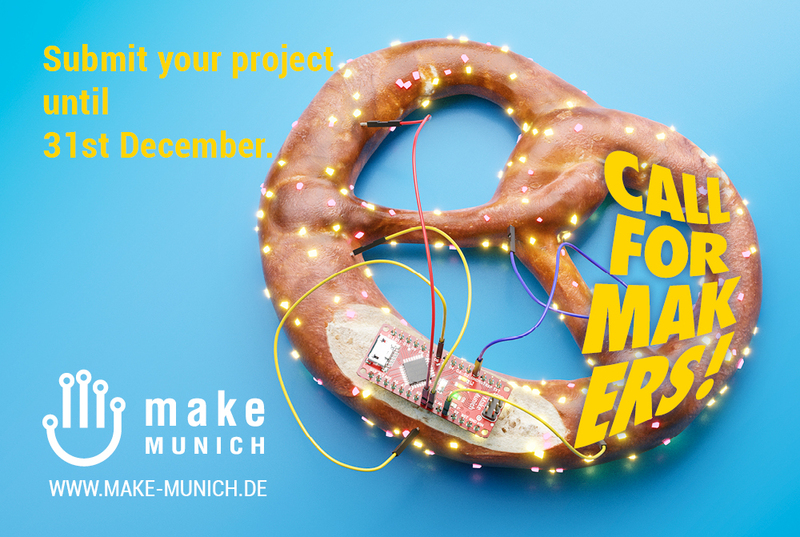 Register with your project for Make Munich and reserve your free booth now. Mark your calendar for 2. and 3. March 2019 when the 5. Make Munich takes place in Zenith in Munich. This year we go for spring, more space outside and second hall together with our sponsor Allnet. We are expecting you and at least 10,000 visitors at the biggest maker festival in Southern Germany. We are currently looking for innovative, ecologically aware, technology-loving makers who will show off their culture and technology and offer makers booths, space to hold workshops, and different platforms for talks and presentations. And it’s free off charge for Makers, NGOs and early Start-ups. Your proxies fits in to the topic of Robotics / IoT / Elektronics / Fashtech & Wearables / Virtual & Agumented Reality / Music & Digital Art / Green Makers & Circular Economy / DIY, Upcycling & Repair Culture / Urban Gardening / Architecture – Tiny houses / Crafts & Design / Biohacking / Citizen Science / Young Makers & Education? Our focus this year is on ideas that make the world a better place. Take 10 minutes and apply with filling out that questionnaire at Make Munich Participants! This is our new platform for the makers. Here you can submit your project and keep it updated. The information will help us to plan the festival and to support your booth, workshop or talk in the best possible way. Deadline for application is 31. December 2018. We will get in touch around a week after with results, plans and next steps. Munich, 8.5.2017. 130 exhibitors, over 70 workshops and 40 lectures – the 4th Make Munich showed that the Maker movement is as broad and diverse as never before and was able to present numerous new trends of the scene. 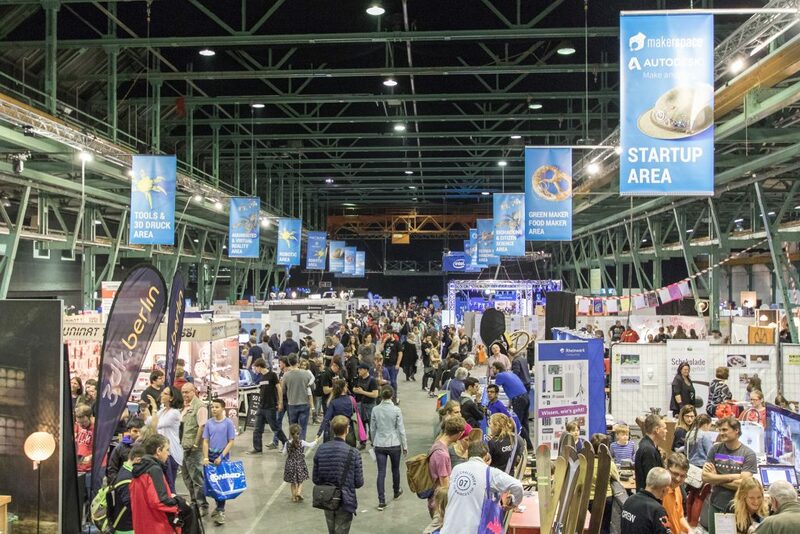 Approximately 8,000 visitors and participants gathered information about the latest developments in 3D printing, IoT, microcontrolling, rapid prototyping, open knowledge, virtual reality and the latest phenomena of the scene such as biohacking and Citizen Science. Visitors especially praised the good atmosphere and the variety of exhibitors with a well-balanced mixture of introductory topics and ambitious visions to touch. The new Quadcopter Area, in which drones could be flown, enjoyed great popularity. Noteworthy that companies such as Infineon, Intel and Audi had long since discovered the huge potential of the maker scene and were represented at the fair with large stands, as were electronics retailer Conrad and other industry giants, as well as numerous start-ups that were able to finance ideas by crowdfunding. The main sponsors of Make Munich in 2017 were Allnet and BrickRKnowledge. With topics such as design & crafts, creativity & art, sustainability & food makers and many interdisciplinary and visionary projects Make Munich also achieves a different perception. While at the first Make Munich events the percentage of male makers and participants was almost 90% and women were more of an exotic minority, the gender ratio in the scene in 2017 has risen to 50:50. Never before have there been so many female makers at the fair. The fair also became a real family event. 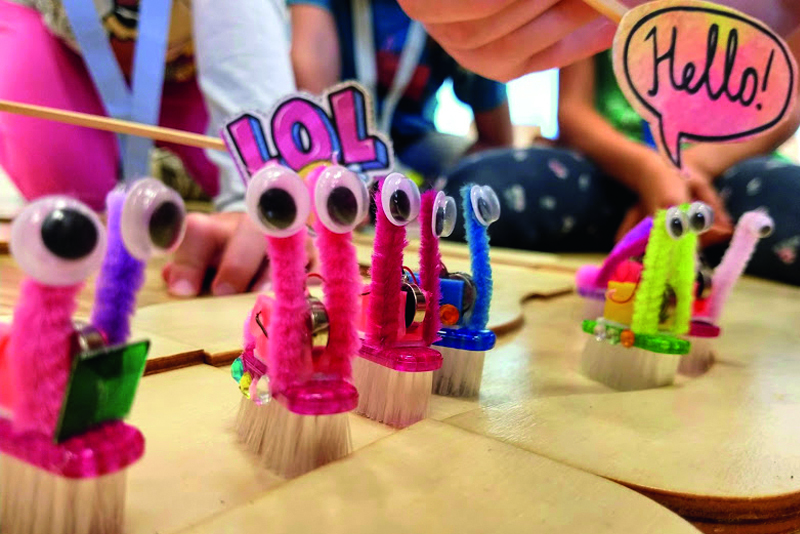 For the kids, there were numerous workshops, from soldering courses to robot tinkering to virtual reality simulations, which inspired the next generation. In the evening program, the competition of homemade robots, the Hebocon, once again provided great enthusiasm and was a real highlight of the fair. The numerous talks on various topics of the maker scene were well attended. Highlights of the program can be seen again on the in-house Make Munich Youtube Channel (https://www.youtube.com/channel/UCFiGnHSz99eXjz2yKzOn9cA).